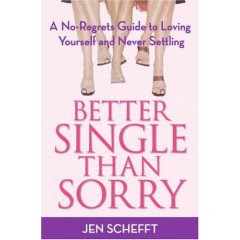 Well I am definitely NOT sorry but I have to say I am curious about Jen Schefft's new book. Jen is the infamous bachlorette who ALMOST married Andrew Firestone. I have to say I was a serious bachelor addict and in a way still am. Of course, I have since given up on the fairy tale fantasy that true love will be found, however, I still think Trista and Ryan are going to last. I still try to follow their storey and hope to see them with a little one here soon!!!! Jen Schefft is also from where we currently live and where Jeff went to high school so even more reason to support the local girl! I will never forget the episode where Jen brought Andrew back to Cleveland and the infamous shot of her being interviewed right in front of the Mentor High School stadium. Every time Jeff and I go to a football game, I always think of that interview. Classic!! !